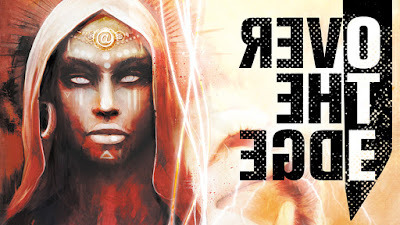 I'm Cam Banks, RPG director at Atlas Games and developer of the new edition of Over the Edge. I first played OTE in 1993, in New Zealand, when I worked at a community center. I had started up a RPG club that met every week using my room scheduling privileges. One of the club members showed up to run OTE and, as I'd seen it on the shelves of the local game store but never looked much into it, I thought I'd give it a shot. We never left the Terminal. I think my love for the game started that day. When one of us shouted out "Guide!" the GM had a Terminal guide pop up from out of what seemed like nowhere to help. He always described the guide from shoes to noose necktie, telling us what color the shirt and pants and tie and shoes were. Such a strange thing to keep going on about. Eventually we figured out that these color schemes never repeated, and while this didn't appear to be connected to anything else that was going on, I never forgot it. Over the Edge is about those little details. It's not a game that demands a lot from you in terms of rules knowledge; it's not even a game that demands a lot from you in terms of understanding how its setting works. But it does invite you, in its weird, dangerous nuggets of lore and behavior and characterization, to be a part of the Edge. Even if you never leave the Terminal, you've become a part of a larger shared narrative that all of us who've played or run the game are part of. Welcome back to the Island. And please, tip your guides generously. I am really excited to see what changes are going to be reflected in this post 9-11 edition.